I might like to do some sort of cichlid stocking if I can (it is a heavily planted tank, so no plant eaters), or something along those lines. I need some bottom dwellers in the tank, if I can go with cichlids, could I get a small school of cories as well? Are there even any SA cichlids that I could fit in a 20g other than any type of ram? 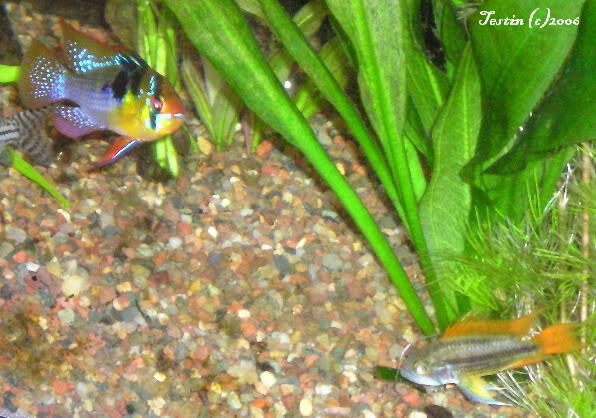 Oh, and BTW, the ram does not like gouramis or bettas, so they are out of the question. Up to any other suggestions though. Please help, the saving grace of this tank not looking naked is the fact that it is heavily planted. edit: ooh, I almost forgot...I also have a booming population of mts in this tank, something that would eat the smaller snails and keep the population in check would be nice too. I agree with adding another GBR, and I think that I would add another 4 ottos as well. I had 10 ottos spread between 3 of my tanks. The one i have left is the only survivor (no, i did not loose the rest in my stupidity lol), and I am not really interested in buying any more if they are just going to die on me. I like the sound of some more dwarf cichlids. Any pointers on breeds that will go well with the GBR, or is it just a matter of whats available/personal preference? I already have 3 other tropical community tanks (tetras, gouramis, platies, guppies, ect. ), so I would really like to go a different route with this one. My main tank (55g) is my semi aggresive (tiger barbs, green tiger barbs, albino tiger barbs, dojo loaches, clown loaches, and a rubberlip pleco). The barbs are really the only fish that make it aggressive lol. I also have a goldfish tank, and three betta/snail/shrimp tanks. that is a pretty fish. I will look around at my lfs today and see what they have. if i don't see anything i like, i may do another tropical community or something, i dunno. I wouldn't recommend apistos in a 20G: they naturally live in large crowds, and I've read in the literature that for a successful setup you need 10-15 to really get the best out of them. Keeping a pair is a possibility, but you could end up with aggression among them and stress: you'd have to try and get hold of a partnered pair. On top of that it would be like keeping one cory or one botia: can be done, but your fish won't be the happiest it could be. For a 20G tall, I know you've already said you wouldn't like more, but rams are the best sort of cichlid for a tank of that size. Try the Cichlid Forum (http://www.cichlid-forum.com) for articles inc. cookie cutters for various tank sizes. I'd look at 10G setups b/c the 20G they have is for a 20G long, not tall. I wouldn't recommend apistos in a 20G: they naturally live in large crowds, and I've read in the literature that for a successful setup you need 10-15 to really get the best out of them. Keeping a pair is a possibility, but you could end up with aggression among them and stress: you'd have to try and get hold of a partnered pair. I think 3 apistos would be just fine but no more than that. Apistos do not pair, they are harem spawners. That definitely explains the recommended 10-15 group size then! yea i am just not sure. I looked at the lfs today, and they didn't have anything along the dwarf side of cichlids, only things like terrors, dempseys, oscars, things like that. i did kinda think about maybe rainbows, or will they get too big? what else could I do along the tropical community lines? Would a school of harley rasboras, a school of scissortail rasboras, a small school of cories, and a couple kuhli loaches work? I would keep the otto and the lone harley in there and probably find somewhere else for the ram to go. edit: could i get away with 2-3 keyhole cichlids? my lfs did have those, i was just looking up info and found they only get up to 4-5". If i went that route, could I still get a few cories, and a couple kuhli loaches?